Have you heard about Shabbat Chai but did not think it was for you or your family? Well think again! Our friendly format is accessible to anyone who wants to experience lively singing, fabulous musicians and a warm welcome to the Shabbat! 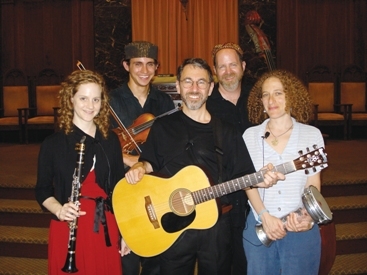 Shabbat Chai combines musical instruments with both traditional, spirited Kabbalat Shabbat melodies and some wonderfully exuberant new ones. The service is completely interactive, with continuous participation by the congregation. A 5:45 PM "Pre-Service Oneg" kicks off Shabbat Chai. Enjoy snacks and drinks while shmoozing with your friends in the lobby outside of the Alperin Meeting House Foyer. The one hour service will begin at 6:00 PM in the Bohnen Vestry. Following the service, stay for dinner if you wish. To reserve your space, click here. Shabbat Chai is for daveners of all ages - separate children activities are available during the service and dinner! Shabbat Chai experience has no parallel! Curious? Please join us to see what it is all about. For more information, please contact any of the clergy at 401.331.1616.